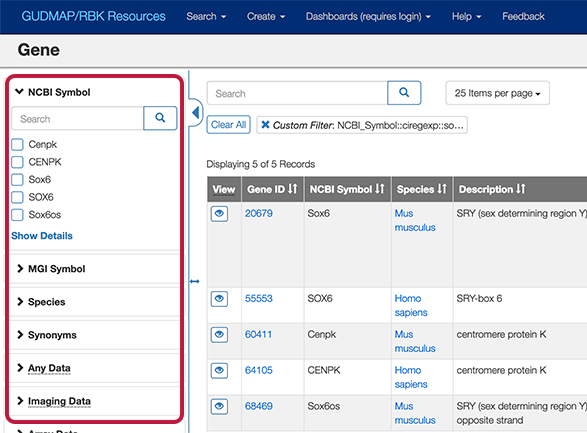 This section describes various ways you can query GUDMAP/RBK data by gene, anatomy and data attributes. Enter a gene symbol/name (or synonym) in the search box on the homepage (https://www.gudmap.org) or by using the menu navigation (Search > Genes). The results include GUDMAP records that contain information about the expression of the gene or genes of interest and any available related data in our repository. Columns indicate the presence of Expression Scoring, Array Data or Imaging data from specimen (in situ, etc). The Imaging column includes representative thumbnails of the imaging data. Each facet is in its own panel and displays up to 10 attributes, ranked by number of records associated with the attribute. You can use the search field in the panel to narrow down your choices before selecting attributes. In this example, we’ve cleared the previous search by clicking the Clear All button. Now we are narrowing down the NCBI symbol list using sox2. Then we can select the Sox2 attribute, which will avoid the results including Sox21, Qsox2, etc. Since the facet panel can only display up to 10 attributes, you can click Show More to open up a window that displays all of the attributes (up to 25 attributes appear at a time; to view more, click the pagination arrows at the bottom of the window). Clicking All will select all checkboxes that appear on the page. Clicking None will de-select all checkboxes. You can also use the search field to narrow down your choices by typing in free text. The search automatically assumes a ‘wildcard’ at the end of the search string; therefore, typing in ‘uro’ will search for words/symbols beginning with ‘uro’, e.g. urothelium, urogenital, uroplakin, etc. 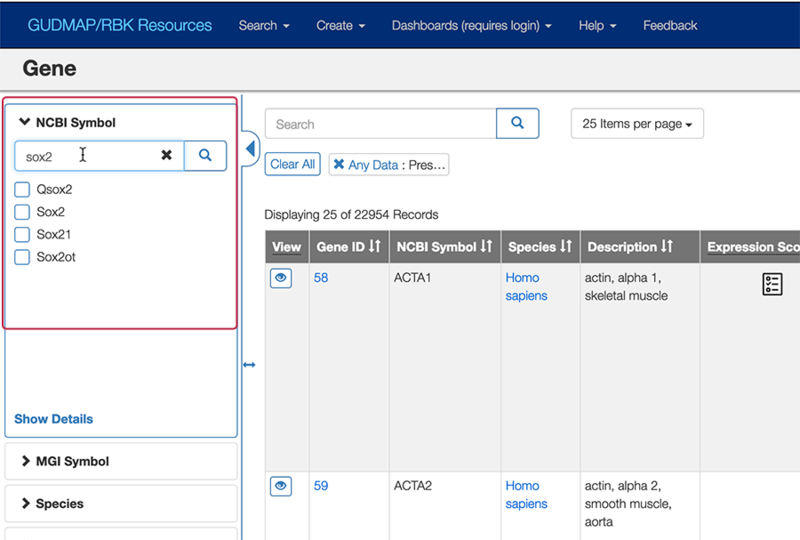 To search for multiple genes, use the search method described above but enter multiple genes separated with a pipe character ( | ) with no spaces in between. This list may contain a mixture of different terms (e.g. MGI accession IDs and MCBI Gene Symbols). in the main search box will returns all the records that have either the sub-string APT6, COX1, or Six2 associated with any metadata as the result. There should be no spaces between | and individual search strings. The search string is not case sensitive. Hover over the seach icon (magnifying glass icon next to the search box) to get the tooltip of the search syntax. If you already have a column of interesting gene symbols in a local spreadsheet, here’s how you can turn that into a query in GUDMAP. Most spreadsheet applications support the concatenation or the text join on a range of cells. For Open Office and Google Spreadsheet, use the following formula to create the search string. - delimiter: A string, possibly empty, or a reference to a valid string. If empty, text will be simply concatenated. - ignore_empty: A boolean; if TRUE, empty cells selected in the text arguments won't be included in the result. - text1 - Any text item. This could be a string, or an array of strings in a range. - text2, ... [OPTIONAL] - Additional text item(s). From the menu navigation, go to Search > Anatomy Terms and choose either Anatomy Tree or Faceted Search. This option provides a tree structure view of anatomical terms that conform to the GUDMAP Ontology. …and the tree will highlight corresponding term(s). 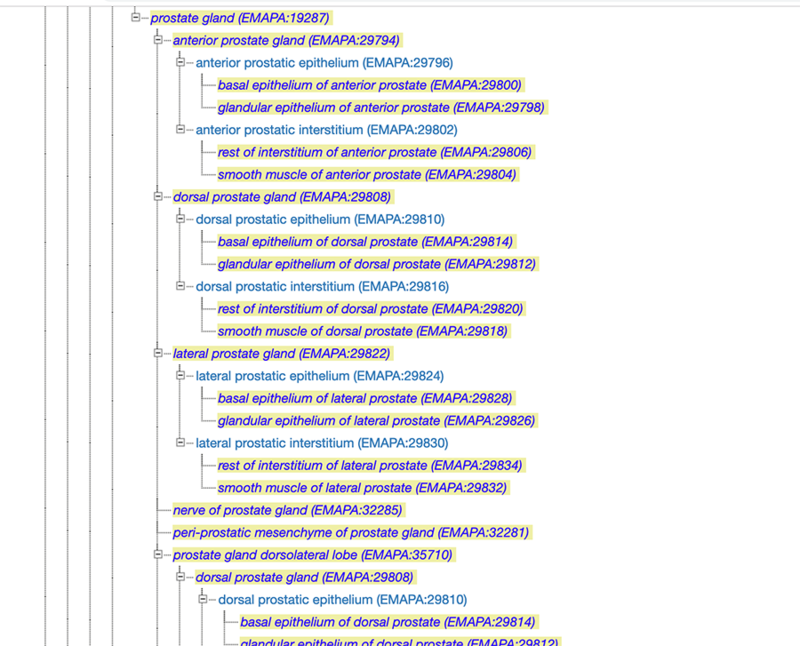 In the following screenshot you’ll see part of the tree with all terms related to “prostate”. 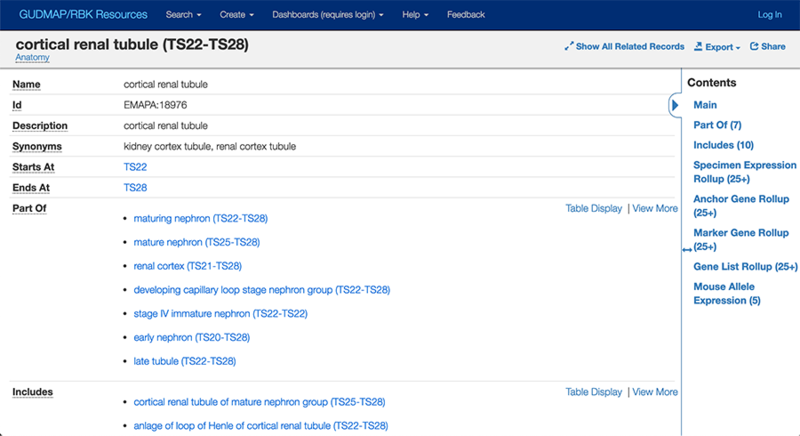 Click a term to go to the corresponding Anatomy records page (see further down the page). This option takes you directly to the Anatomy section of the Data Browser where you may use the faceting sidebar to choose or search for anatomy regions by Name or ontology IDs (ie, EMAPA:18976). Click the eye icon of the row you’re interested in to view the corresponding Anatomy record page (see below). We click on the eye icon in the first row to display the following Anatomy record page. 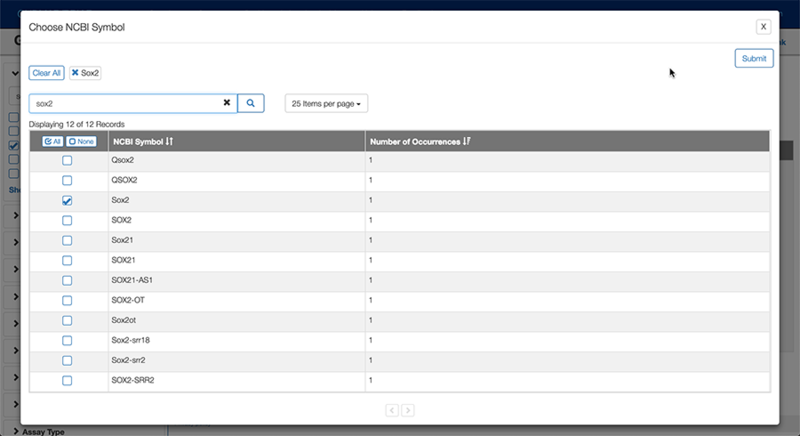 The numbers to the right of the names indicate how many instances of these types of data are available. The Boolean Anatomy Search allows complex queries to be constructed to search for gene expression based on selected anatomical structures. The search allows combinations of structures and developmental stages and different combinations of expression found to be present, not detected and uncertain. The search can be applied to a combination of structures or just to one structure. For example, you can search for only genes expressed in a structure, or to compare expression in the same structure at different stages. For more details, please go to the Boolean Anatomy Search help page.